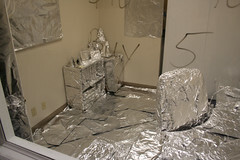 When Brian Schwartz left for his Honeymoon last week I know he wasn't expecting to find this when he came back! We knew Brian was getting back from his honeymoon and coming into the office today, so yesterday we purchased 600 sq/ft of reynolds wrap from Sam's Club. After that we got to work. Throughout the afternoon we spent a few minutes here and there working on the office, wrapping everything that wasn't fastened down. After our company meeting last night three of us stayed late to finish up the office. We wrapped EVERYTHING. We wrapped every book, stack of papers, spare change, the desk, bookshelf, whiteboard, a paperclip, a tie, a pair of pants, the office door and we even layed the last of the foil on the floor to cover the carpet. Check out some of the photos I uploaded over on Flickr.